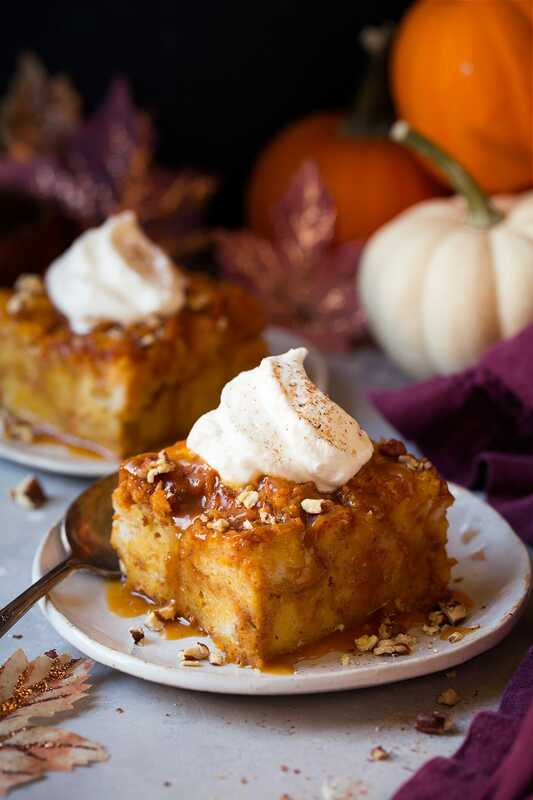 Pumpkin Bread Pudding will likely be one of the best things you bake this fall! Yes it’s just that good! 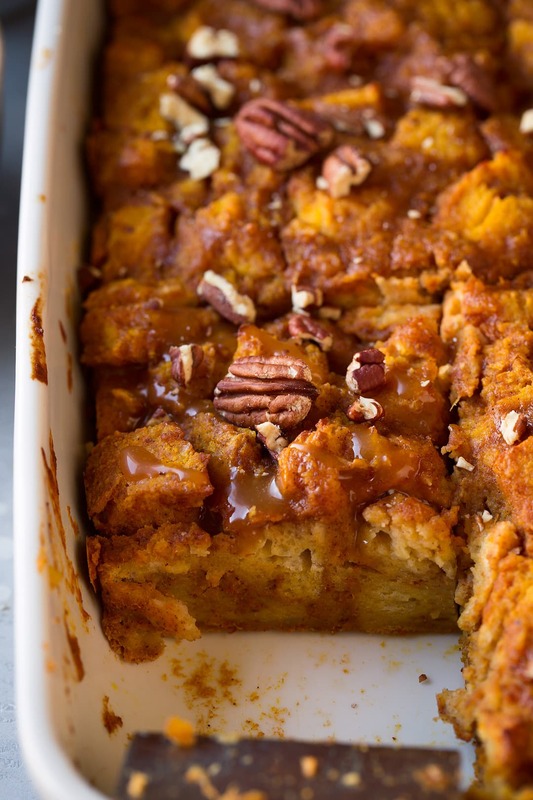 It tastes just like pumpkin pie but in bread pudding form. It’s rich and creamy and delicious in every way. And it’s taken to a whole new level of goodness when you top it with homemade Salted Caramel Sauce, lightly sweetened whipped cream, and crunchy toasted pecans! So many delicious flavors and textures that all blend so well together. 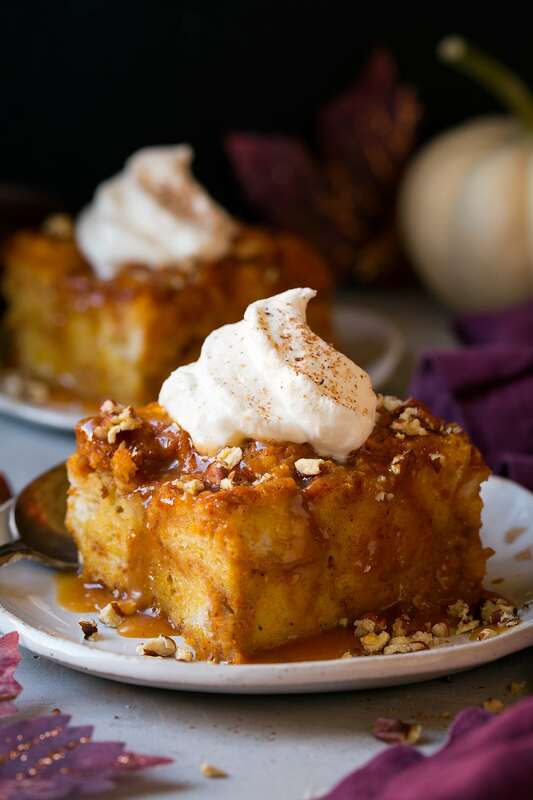 Oh and this nearly identical to a pumpkin french toast casserole so if you want to make this for breakfast on the weekend or Thanksgiving morning that’s totally acceptable. Mine is gone by now but oh how I wish I had another slice left. Guess I’ll have to make it again this week! In a mixing bowl whisk together sugar, spices and salt. Whisk in eggs and egg yolks. Stir in half and half, milk, pumpkin and vanilla. Place bread cubes in an extra large mixing bowl. Pour milk mixture evenly over bread cubes then gently toss to coat. Let rest 10 minutes. Bake in preheated oven until set, about 45 – 50 minutes. Let cool for a few minutes then cut and serving with toppings. If you want that crusty bread to be easier and less messy to cut just buy it a day in advance and wrap it in a plastic bag. It will soften that crust up making it easier to cut through. But if you are doing a last minute treat like I did don’t worry if you didn’t plan ahead. It will still work fine with fresh bread. A great thing about this bread pudding is that you could prep it a day in advance then just let it rest in the fridge and bake it the next day. And if you like your bread pudding wet, feel free to add an extra half cup or so of milk. I don’t like mine dry but not soggy either. Fresh pumpkin puree would work well here too. 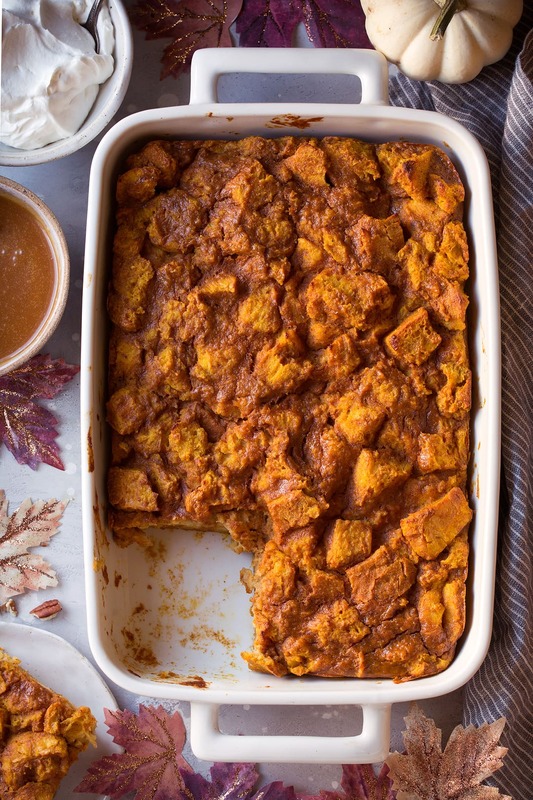 Can I Use Pumpkin Pie Spice? 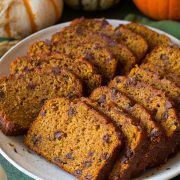 If you don’t already have all the spices listed on hand then 3 teaspoons of pumpkin pie spice will work well here too. Half and half sold here in the United States is basically a mixture of half milk and half cream. Here you could replace the half and half with 3/4 cup more milk and 3/4 cup cream. 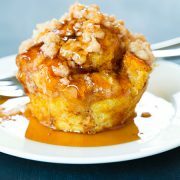 This stuff is over-the-top delicious and likely to be a family favorite! You can prep it a day in advance and store it in the fridge then bake the following day but do be sure to serve it warm for best results. Preheat oven to 350 degrees. In a mixing bowl whisk together brown sugar, granulated sugar, cinnamon, nutmeg, ginger, cloves and salt. Place bread cubes in an extra large mixing bowl. Pour half and half mixture evenly over bread cubes then gently toss to coat. Let rest 10 minutes. Spoon mixture into a buttered 12 by 8-inch or 13 by 9-inch baking dish (I like to lightly press down on the cubes to even it out a little). Bake in preheated oven until set, about 45 - 50 minutes. 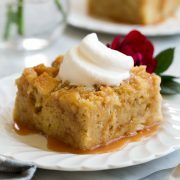 Let cool for a few minutes then cut and serve with salted caramel sauce, pecans and sweetened whipped cream. Follow link HERE for salted caramel sauce step-by-step photos and recipe. Toppings not included in nutritional information.